Before jumping into Twitter, outline your objectives. Obviously, as a business owner, your priority is to sell but you should attempt to dive a bit deeper. You won’t see Oreo pushing sales, nor will you see Gap linking back to their clothing collection very often. These companies are all motivated by the bottom line but they’re driving sales in a multitude of ways from providing everything from comical entertainment to engaging 1-on-1 conversations with customers. Why do my customers love me? No customers yet? Take a guess at what it is about your brand audiences will love. We’ll see if you’re right and you can always change that answer later. How do my customers engage with me? Do they visit your retail location? Have you been writing a blog that sees frequent readers? It’s important to understand how your audience currently engages with you so that we can build on that later on. Rather than simply trying to pull people towards you, it’s important to participate in (physical and digital) spaces they’re already familiar with. This will also be explored more so that you can expand your audience by finding new customers similar to your existing audience. 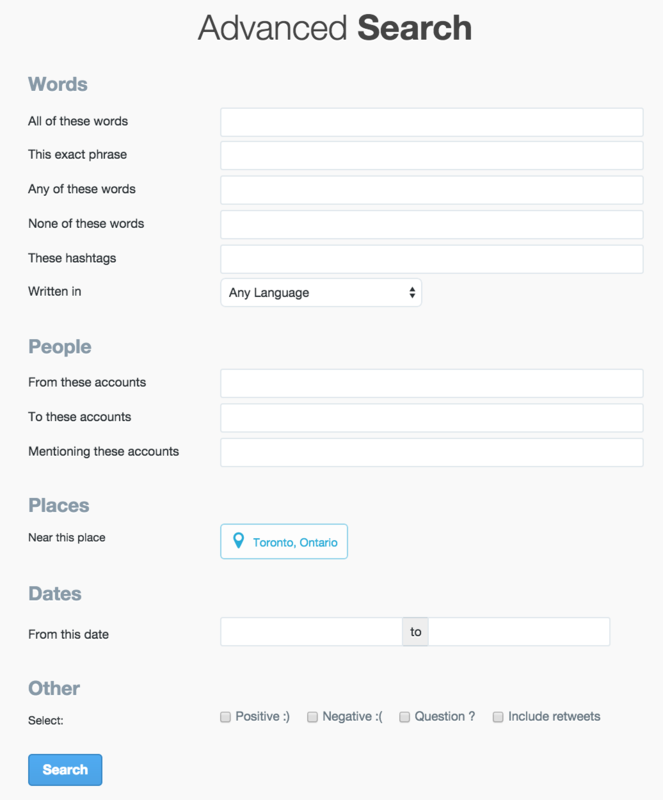 With these questions asked, you have some key information to build your Twitter strategy. Understanding your relationship with your customers and what they value is paramount in creating a long lasting brand and one that will succeed on Twitter. These questions aren’t easily answered and you might need to start digging around a bit to understand your audience. Here are a couple research methods to get you started. The search box in the top right of the navigation bar allows you to search for Tweets, people, photos, videos, news, and timelines (Twitter lists and collections) that relate to a particular keyword. Utilizing Twitter search can help you find potential customers and jump into conversation with them. Twitter also incorporates basic sentiment analysis to see if people are Tweeting positive or negative statements, or if they’re asking questions. Search your keywords closely associated with your business. Take note of influential users who are active on topics important to your brand. These users can be added to a private list of influencers who you can reach out to in the future. How often do they Tweet? Aside from replies to others, how often do they post unique content? When do they Tweet? Are their Tweets spread out all day or only between set hours? What do they Tweet about? Do they always Tweet about their own products and services? Do they talk about your industry? Is everything just random? What types of Tweets do they share? Quotes, questions, and links to content are typical. What types of media do they use? Are your competitors including images, videos, and presentations with their Tweets, or are they typically text only? How effective are their Tweets at engaging their audience? As you scroll through their Tweets, you can see the number of retweets and favorites for each Tweet. Note the popular ones. You can do this research manually, or you use Rival IQ to help. This tool will allow you to enter your business's Twitter account, along with your competitors’, to see a direct comparison of your activity. Once you've conducted this research with several of your competitors, you'll likely have a good idea of where to start when answering the same questions for your own strategy. Once you've researched multiple competitors, you'll be able to combine the best Twitter strategy for your own business.